There is hope for the Hollywood! But there’s still work to be done! A development application has been submitted to the City of Vancouver for the Hollywood Theatre and the 100-foot site adjacent to the theatre to the west. The proposal would see the Hollywood Theatre’s current owner retain the Hollywood Theatre with irrevocable Heritage designation, through a Heritage Revitalization Agreement (HRA) and operate it as a for-profit entertainment/cultural venue . The HRA would transfer existing development potential of the Hollywood property to the adjacent lot, together with additional bonus density as an incentive for heritage retention and restoration. The result would be a 6-storey mixed use, commercial/residential (strata) building next door to a revitalized Hollywood Theatre. Your presence at the Open House is vital!! Although the handling of a similar proposal in 2016 suggested that the City was seeking to acquire the Hollywood in exchange for bonus density, city staff are clearly taking a different approach to the present proposal and looking for public opinion to inform next steps. Thus, given your support for the Coalition’s efforts to Save the Hollywood Theatre, we offer the following two questions and related views as a way of summing up the Coalition’s perspectives and concerns, reached on the basis of meetings with project architects and proposed operators, as well as limited discussions with City staff. Will the currently proposed outcome for the Hollywood result in a vibrant arts and cultural venue that will benefit the community and the city in perpetuity? We believe that a strong Community Use Agreement (CUA), forming a part of the Development Permit, must include generous commitments to film, non-profit, and community cultural use – in perpetuity – in return for the contemplated density bonus. An important element in this project, we believe, is a public memory of what the Hollywood was, and should continue to be: a movie theatre. This is not to say that the Hollywood should be only a movie theatre. Indeed, we know all too well that the Hollywood needs to become a more versatile multi-use venue, supporting a wider range of screen and performing arts, to be economically viable and sustainable, and we are fighting for that. But we also believe strongly that a significant portion of the programming should be dedicated to cinema: at least 35-40%. We think it’s worth noting that the Rio Theatre has operated as an economically viable, self-sustaining business with 60% film programming for 10+ years; a pretty good track record. Equally important, is a generous commitment to prime-time non-profit and community cultural use; a chance for the community to participate and be part of the Hollywood’s future as a true community amenity. This should be written into this CUA as well. Last, but surely not least, heritage designation of the building (part of the HRA) should go well beyond its iconic façade, and encompass key elements of the interior theatre space, including sloped floor and seating, as well as original 35 mm projection equipment (with new digital projection technology added). And, finally, we believe that designation should include the Hollywood Theatre’s continued use as a theatre/performance space, in perpetuity. Is a privately-owned, for-profit business model the best possible outcome for the Hollywood Theatre, and is it the only way to see the Hollywood’s heritage restored and preserved? The fact, of course, is that the current proposal would, indeed, see the Hollywood’s heritage restored and protected (details to be determined). As you know, however, the Coalition’s aim has always been for a non-profit, community-oriented outcome that protects the Hollywood’s heritage and addresses the critical shortage of affordable arts and culture capacity on the West Side. And, while the City is taking a different approach with the current application, its handling of a similar redevelopment proposal in 2016 appeared to confirm that a City-owned, non-profit outcome is, in fact, a realistic option. So, while we acknowledge and appreciate that the present proposal for a for-profit Hollywood Theatre has a lot in common with the Coalition’s plan, we continue to have reservations about the extent to which the proposed for-profit operation could deliver the same cultural capacity as a public, non-profit venue. Is it enough to guarantee a healthy balance of programming, including regular cinema screenings and prime-time cultural non-profit use, through a solid Community Use Agreement? Perhaps it is. But, the question remains whether public vs private and non-profit vs for-profit should continue to be on the table, and whether the current deal is striking the right balance between development incentives and public benefits. We are continuing to ask questions and encourage you to do the same. What we know is that the Fairleighs ran the Hollywood Theatre as a successful family business for more than 75 years, and that the community has a wealth of fond memories of it. And, the good news is that the Hollywood’s future looks brighter once again as a result of your support and determination! So, be sure to come on out to the Open House and HAVE YOUR SAY! – Let the City know what’s important to you! Details of the Development Application can be found here. 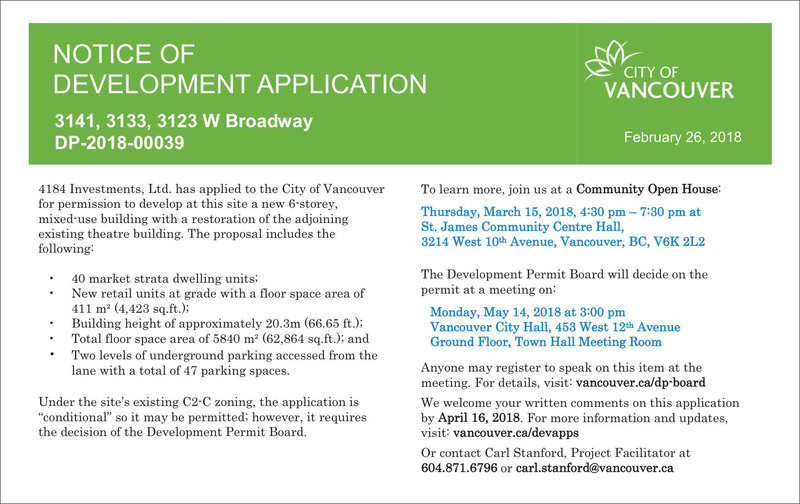 *For additional issues concerning the adjacent building which forms a large part of this development application, please see this letter sent by the West Kits Residents Association (some of whose members are part of Save The Hollywood Theatre Coalition) to their members. Note in particular points 2, 3 and 4.